Baked chicken nuggets and sweet potato strips. Boneless, skinless chicken breast coated in olive oil, panko, and parmesan, seasoned with Mrs. Dash garlic & herb, and sprayed with olive oil. Serving size is four ounces. 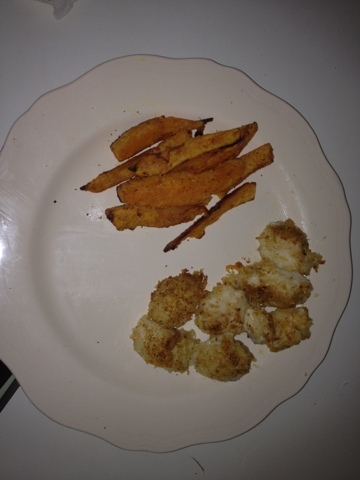 Sweet potatoes were coated in olive oil and seasoned with paprika and Mrs. Dash garlic & herb. Serving size is the equivalent of half a sweet potato.